Silver Spring, Md. 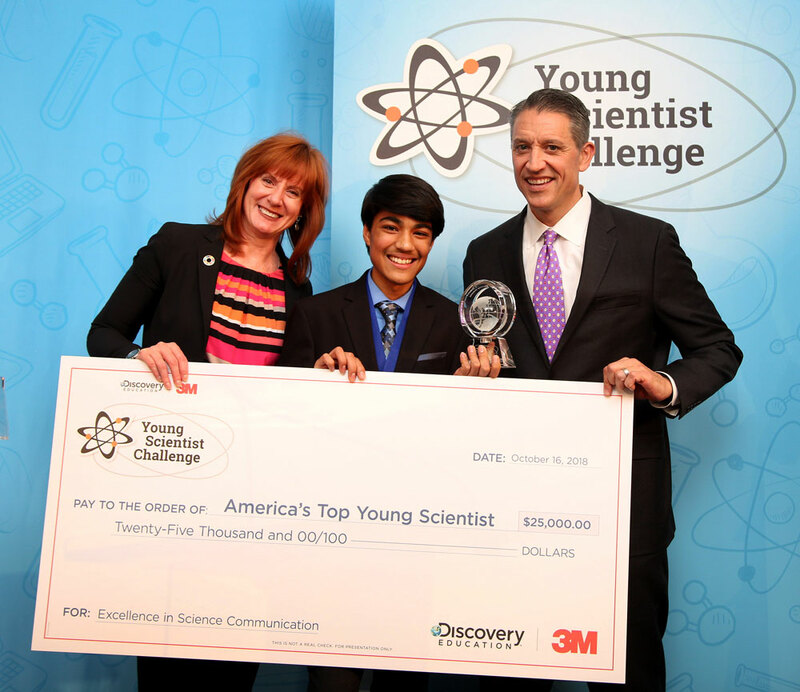 and St. Paul, Minn. (October 17, 2018) – Discovery Education (@DiscoveryEd) and 3M (@3M) have named 13-year-old Rishab Jain the winner of the 2018 Discovery Education 3M Young Scientist Challenge (#YoungScientist). Rishab created an algorithm to make pancreatic cancer treatment more effective by using artificial intelligence to accurately locate and track the pancreas in real-time during MRI radiotherapy. Pancreatic cancer is the third-leading cause of cancer-related deaths in the United States, according to pancreatic.org. An inherent challenge of radiation treatment for pancreatic cancer resides in targeting the pancreas itself. Firstly, it is often obscured by the stomach or other nearby organs, making the pancreas difficult to locate and second, breathing and other anatomical changes may cause the pancreas to move around in the abdominal area. As a result, radiotherapy treatment can inadvertently target and impact healthy cells. Rishab developed and tested his algorithm using images of the human digestive system, and found it could correctly detect the pancreas with a 98.9 percent success rate. The innovation aims to improve accuracy, reduce invasiveness and increase efficiency during treatment, resulting in better quality of life and chance for survival among patients. A seventh-grader at Stoller Middle School in Portland, Ore., Rishab competed alongside nine other finalists during a live competition at the 3M Innovation Center in St. Paul, Minn. He was awarded the title of “America’s Top Young Scientist” and received a $25,000 prize. During the summer, the finalists had the exclusive opportunity to work with 3M scientists to develop their innovations as part of a unique mentorship program. Rishab was paired with Dr. Döne Demirgöz, a 3M corporate supply chain black belt and product development and research expert who takes the products developed in 3M labs and brings them to the marketplace. The finalists presented their inventions to an esteemed panel of scientists and leaders from both Discovery Education and 3M. In addition, they competed in two other challenges that combined multiple 3M technologies to solve a real-world problem. The nine finalists received $1,000 and a variety of prizes from Discovery Education and 3M. The second, third and fourth runners-up also received a trip to a taping of a show on Discovery’s family of networks. In second place: Mehaa Amirthalingam, an eighth-grader at Sartaria Middle School from Sugar Land, Texas, developed a toilet flushing system that uses both fresh and recycled water to reduce water consumption in the home. In third place: Leo Wylonis, an eighth-grader at Tredyffrin-Easttown Middle School in Berwyn, Pa., designed a device for airplane wings that mimics the twisting motion of a bird in flight, increases fuel efficiency and reduces carbon emissions. In fourth place: Sriram Bhimaraju, a sixth-grader at Harker Middle School in Cupertino, Calif., developed an Archery Assistant app that improves an archer’s accuracy by correcting form in real-time using a Bluetooth sensor. Anna Du, a sixth-grader from Andover School of Montessori in Andover, Mass. Anna created an underwater device that uses infrared light to detect harmful microplastics in the ocean. Julia Gelfond, a seventh-grader at Silver Creek Middle School in Chevy Chase, Md. Julia invented an innovative use for dissolvable gel that can fill a tooth hole after it has been extracted to alleviate pain, infection and suffering. Zachary Hessler, a seventh-grader at Gifford Middle School in Vero Beach, Fla. Zachery developed a method using light technology to reduce noise pollution. Theodore Jiang, an eighth-grader at Paul Revere Charter Middle School in Santa Monica, Calif. Theodore invented Textricity, a smartphone case that harvests energy from finger taps on the screen to charge the phone’s battery. Cameron Sharma, an eighth-grader at George H Moody Middle School in Glen Allen, Va. Cameron created uFlu, an algorithm that uses artificial intelligence and machine learning to identify personalized flu vaccines. Krish Wadhwani, an eighth grader at DeSana Middle School in Alpharetta, Ga. Krish developed a medication that could potentially cure Huntington’s Disease, a degenerative condition in the brain that currently has no known cure. Since its inception, the Discovery Education 3M Young Scientist Challenge has awarded hundreds of thousands of dollars in student prizes, paired students with world-renowned scientists to give them real-world insights and delivered much-needed science resources to millions of students, teachers and families across the country. It targets students in the years when research indicates their interest in science begins to wane and encourages them to explore scientific concepts and creatively communicate their findings. Winners have gone on to be featured in Forbes magazine’s annual “30 Under 30” list, speak in front of members of Congress and attendees at the United Nations, meet the President of the United States, and demonstrate inventions on national television programs such as ABC World News Tonight, Fox & Friends, and The Ellen DeGeneres Show. The annual premier competition recognizes scientific thinking and imagination in students grades 5-8 who dream up a solution to an everyday problem that ultimately could reshape and improve the way we live our lives. To download hi-res images of the science competition, click here. For more information on the 2018 Discovery Education 3M Young Scientist Challenge and to learn more about this year’s finalists, go to www.YoungScientistLab.com. Discovery Education 3M Young Scientist Challenge materials are also available through Discovery Education Streaming Plus. For more information about Discovery Education’s digital content and professional development services, visit discoveryeducation.com. Stay connected with Discovery Education through social media on Facebook, Twitter, Instagram and Pinterest @DiscoveryEd.